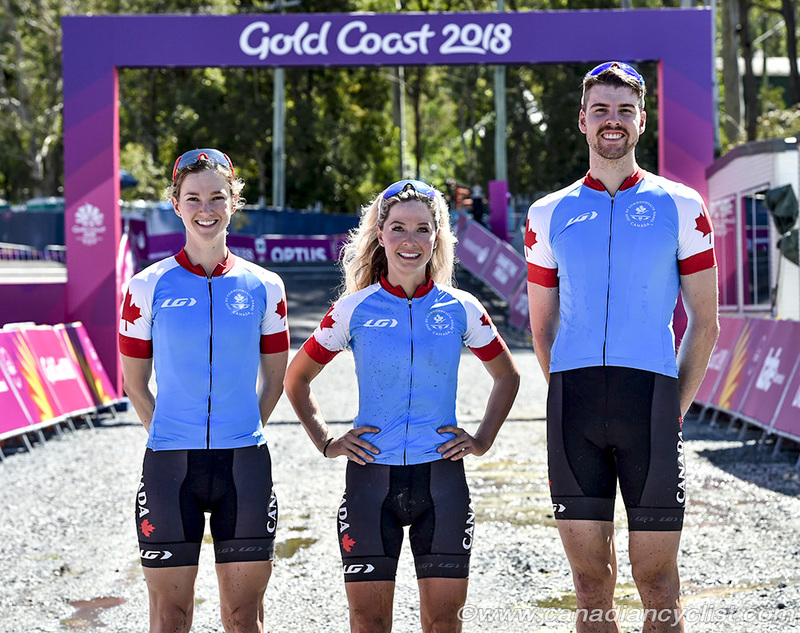 Canada's mountain team is favoured to win medals at the Commonwealth Games, having won all of the three past women's gold medals, plus one men's. 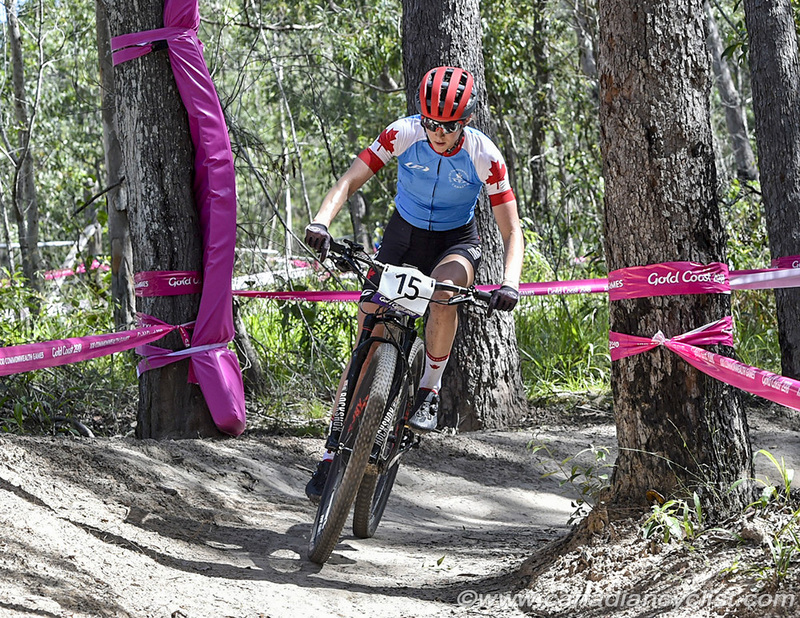 The team of Emily Batty and Haley Smith for the women, and Leandre Bouchard for the men, have been training on the Nerang course, and took a few minutes to speak with us today, after training. "It's actually a pretty fun track to pre-ride. We've got a few days on the track now, so things are clicking and coming together well. I'm going to race my full suspension. It's going to be high speed, and I think flats are going to be a big concern; I've seen a lot of flats in pre-riding. So, getting the tire pressure perfect is going to be very tricky because there are some steep climbs that you might end up running if you don't have enough traction. I think it's going to be a tactical race because it will be high speed on this course. It will be hard to shake riders, so I think there will be some pack racing. I've definitely come here for a medal, and nothing less. I think there will be three or four riders in the mix. It's not an 'out of sight, out of mind' kind of track; you can see for quite ways, and that will bring packs back together. If it does come down to a sprint it will be pretty spectacular, since we end up on the track [it finishes in a asphalt velodrome]. If it comes down to a sprint, I'm game for that. The pressure is not so much, to be honest. In our sport, we don't look at the Commonwealth Games as much as some other sports do. 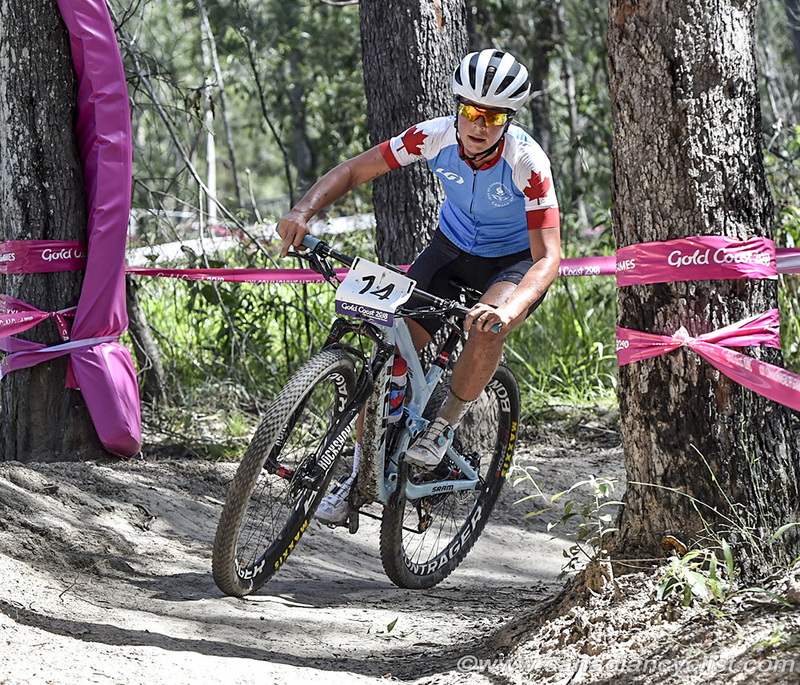 It's definitely a result to add to the resume, so I am going to go for the gold, but it's still April and the World Cups are my focus. This is kind of a bonus race. I went down to Tucson [Arizona] prior to this event just to get some heat acclimatization. But here it is a lot more humid, so there is that element that might creep in mid-race; just another technical element adding to the race! "I think it is a really nice course. I'm getting used to it and have already done almost ten laps, and I feel fast and confident on it. I think it suits me well; both my technical skill set and my physical abilities. It will be fast; the uphills are not that steep. It will be better for me as a tall rider. I think the New Zealand riders are beatable, and there are other nations to watch out for, like Australia, England and South Africa. I hope to be in medal contention. It's true that it is pretty hot, but I perform well in the heat and have gotten some of my best results in warm conditions. For example, the 2016 Cairns World Cup was early in the year and I did well there. So, the heat is not a issue for me. I think the rocky sections will require double suspension; the rest of the course you don't need it, but for the rocks you will. 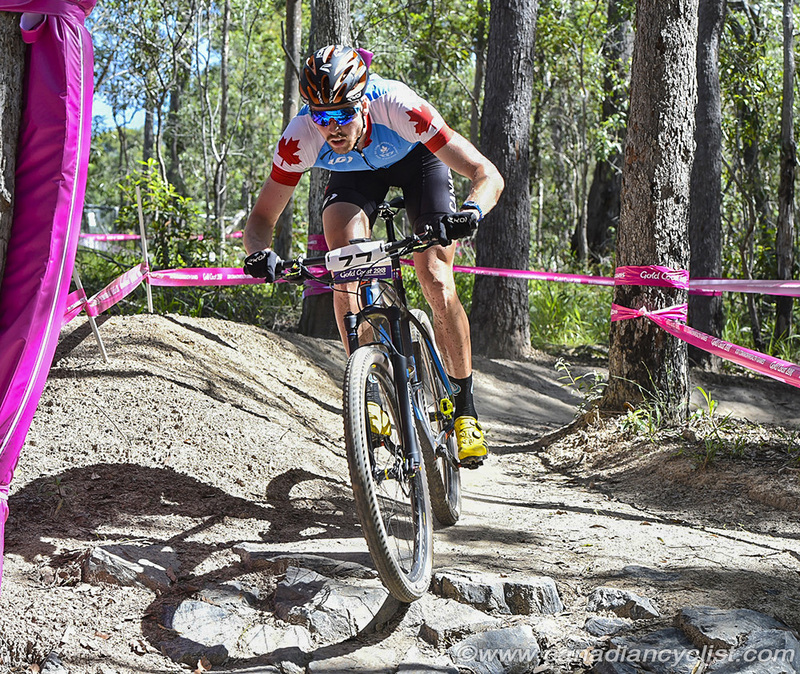 The course is different than what we are used to; World Cups have more intimidating features, usually downhill. Here, the downhills are very smooth and flowy. The climbing is difficult, it's steep and rocky and there are 'make or break' sections - the first people will make it up and everyone else may have to dab. I enjoy the course and it's engaging, so I'm sure it will be good on race day. I'm pretty sure I'm racing my hardtail. I tested both and done many laps on both, and I think, for me at least, it's a hardtail course. It is and it isn't different from other races ... it is a bike race, and I know how to do a bike race; it's what I love to do and I feel confident in that respect. It's a little different because it's a smaller field and a strong field. It almost feels like a national championship because there are fewer riders and it's a bit higher pressure. the coolest and most different part is the [athlete] Village. You are living amongst other athletes and hearing the different languages and seeing the athletes from different sports ... it's just such a wide range of peoples and passions. It's very inspiring. We are going to do our best, we are going to go out there and give everything we have, and race like we know how to race. That's all we can do; so the pressure is irrelevant. I think the course will cause some tight racing. there aren't a lot of selective sections. The first half is very rough and the second half is very flowy. There is no substantial climb of any great extent, so I think the top riders will be pretty similarly matched and it will come down to a bit more of a tactical race than we are used to seeing. I don't think the heat will be too much of an issue for us. We did some heat training earlier this year and then the South African World Cup, so I think we are relatively well prepared.